At some point during last year I understood the dangers of eating foods that spike blood glucose levels. I knew in theory that fat and proteins don’t spike your blood sugar and refined carbs and sugary foods do. So I decided to put the theory to test and watch the effects of food I eat on my blood sugar in real time. So I took nearly 50 readings using a glucometer over the course of a week. It was a regular work week and I tried to keep everything as normal as I could. 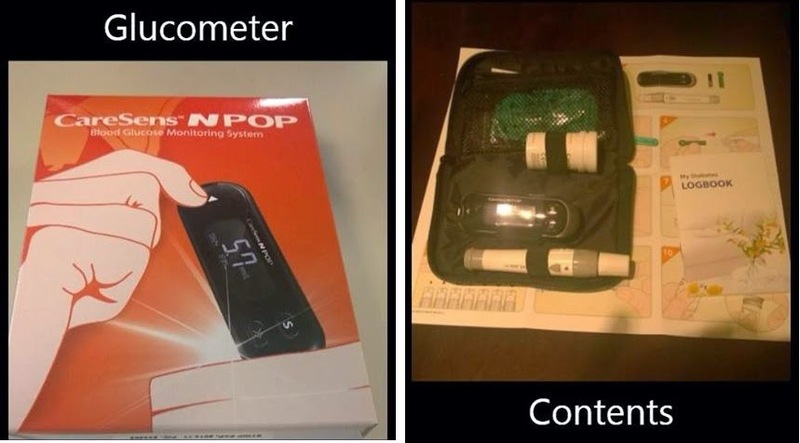 Talking of glucometer, it’s one of the most effective tools at our disposal. Add to the fact that it’s so inexpensive, anything that can give you instant feedback on the food you have just eaten and how it affects your blood sugar is priceless. For example, everyone tolerates carbs to a different degree. An insulin sensitive person should be able to clear out the blood glucose a lot more effectively compared to a person who is insulin resistant. A leaner person who is insulin sensitive may have even higher carb tolerance and they may be able to get away with higher levels of carbs. A person who already has some degree of insulin resistance may not have the luxury of eating over 100 grams of carbs in a day barring a very active lifestyle. It also helped me decide how I can smartly use starches like sweet potato or rice after a heavy training session to get some quick energy without causing a glucose\insulin spike. Even 2 days worth of data will be invaluable and more importantly it's unique to you. And it's not something you have to do every single week. Even once in 3 months or 6 months or even a year may suffice. One of the hallmarks of eating whole foods ancestral style is that your blood sugar remains in a very tight range, just like how body likes to keep it in. Because you will be consuming large amounts of vegetables, salads, healthy fats and high quality proteins. Eating refined foods and sugar foods on the other hand will generate massive amounts of glucose and body responds by spiking insulin production. High blood sugar damages proteins and fats in the flood causing Advanced Glycation End products – AGE. See how ironic that is, it AGEs you. High blood sugar is also a proxy for high insulin and this incessant insulin spike meal after meal over the years will make you insulin resistant bit by bit, first making you pre-diabetic and eventually resulting in full blown Type-2 Diabetes. Couple of points to keep in mind as you read the table. 1. Body likes to keep blood glucose in a very tight range. For example, it should normally be between 4.4-6.6 mmol/L before a meal. 2 hours after eating it should be less than 7.8 mmol\L. If you eat a massive dessert on top a regular modern meal, your blood sugar may spike to 11 or 12 mmol\L and body will galvanize chief hormone player insulin to deal with this situation and bring blood sugar levels back in the normal range. If post your meal you don’t wander too far away from the ideal range, I hope you can see how that’s a good thing. My blood glucose levels were 5.2 mmol\L 1 hour 10 minutes later after lunch of chicken broth and a bit of cream. And 2 hours and 5 minutes later, levels were at 5.7. Here are the 50 readings from the week and chart view. 1. My glucose levels go down after bulletproof coffee. Alternatively what I have not shown here is that my ketone levels go up. It’s the magic of MCT oil in the bulletproof coffee and it’s pretty clear from the cognitive boost I feel. Look at what happened on 23rd before I went to the gym – my glucose levels dropped from 5.7 to 4.3. I was playing around with MCT oil as a pre workout. 2. My glucose levels are almost the same – before and after the breakfast. Typical breakfast here means pastured eggs done in butter typically accompanied with wild bacon. So it was pretty much all proteins and fats, almost negligible carbs which explains almost no fluctuation in blood glucose levels. 3. Consuming a typical dinner of veggies with some meat AND starches with it after a gym session doesn’t move the glucose levels a lot. This tells me that my muscles are glycogen depleted and take up most of the glucose that’s generated from sweet potato or rice. On 28th however I didn’t go to the gym and decided to have starches along with my dinner which I typically don’t do. 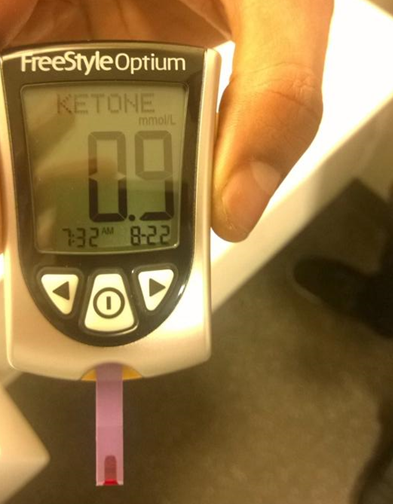 20 minutes after the meal, glucose had already elevated to 7.3 and that’s when I ran out of the glucose strips. I suspect it peaked at around 8 or so before it started dropping.